If you are crazy about the Bloody Mary there are a couple of stops on the local’s list for this alcoholic eye-opener. While some people focus on the mix, others are about the garnish, and to some it is all about flavored vodka. No matter your style, you are sure to find the drink to fit your taste at one of these Napa locations. We have to start with Downtown Joe’s since it is a mere two blocks from the Inn, and they boast the progressive Mary. 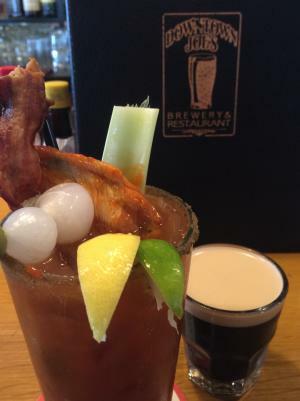 Monday through Friday the Bloody Marys are fairly typical and made from a classic house-made mix of tomato juice, Worcestershire sauce, pepper, and horseradish which adds a good bit of spice to the flavor. The vodka is Absolut Peppar, and the garnish is your olive, onion, and celery with a celery salt rim. On Saturdays, they add a piece of bacon to the garnish; and on Sundays, it is bacon, a chicken wing AND a sidecar of stout. $12 regardless of the day. Downtown Joe’s is a local hangout that has been in downtown Napa for decades. Owned and run by locals, you will find your blue collar flavor here. Right next door to the Inn is the Napa General Store, which serves breakfast to noon every day of the week and has an outstanding riverside patio for al fresco morning meals. Headlining the “Grown-Up Drinks” section is their Mary: hand-shaken horseradish Bloody Mary with pickled green beans. $11. Those who need serious choices in the Bloody Marys might want to try Fume Bistro & Bar. They offer Classic, Spicy, Wasabi, Maria, Citrus or Bourbon Marys for $9. Fume is located off Highway 29 on the north end of Napa. With a wood fired oven and a strong brunch menu they are a local’s favorite for good comfort food and warm atmosphere. One of the better Huevos Rancheros is on their brunch menu, and a Bananas Foster French Toast that will put you in a food coma for days. Last on our short list is Hop Creek Gastropub and Nonobrewery located in a small shopping center in Brown’s Valley (west Napa). You will find the Creekside Green Chili Bloody Mary which is doubled up with St. George Green Chili and Seagram’s vodka, $10. This Mary is named for the lovely little patio in the back that nestles up to the creek. The gastropub is getting high marks from the locals for their beer, their location, and their menu. While almost every bar in Napa will offer you a Bloody Mary, usually spiced to your preference, we picked Napa restaurants that offered the Mary on their menu. No matter where the morning munchies take you, we are certain you will not be disappointed by the food in Downtown Napa nor your beverage of choice.